Your data is fragmented across a wide variety of environments and applications, but your critical backup and recovery infrastructure doesn’t have to be. Cohesity’s solution is designed to fit easily into the widest possible variety of enterprise IT environments. And with Cohesity’s unique ability to present itself as NFS storage to 3rd party backup software, you can easily begin your journey to a modern, web-scale solution without a forklift upgrade. Cohesity DataProtect supports a broad set of hypervisors, clouds, storage arrays and other adapters to deliver enterprise-class backup and recovery. Then go further with Cohesity’s comprehensive set of secondary applications and services, enabling you to do more with your backup data. Protect your data, wherever it lives. 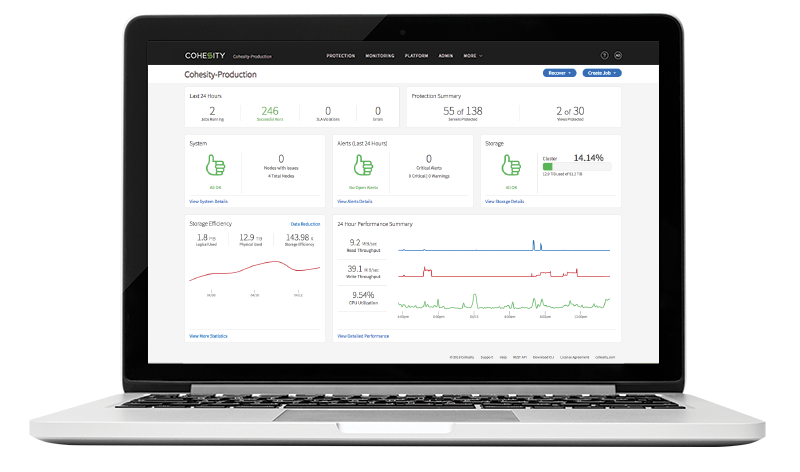 Cohesity supports your virtual, physical and cloud environments, as well as business-critical applications with a single web-scale solution. Software-defined solution to match your business requirements. Choose from Cohesity, Cisco UCS or HPE certified appliances for on-premises or private cloud installations, or software only for cloud and remote office environments. Harness the power of data. Meet compliance requirements and gain insight into your infrastructure with built-in analytics. Use data copies efficiently to accelerate application development. Application consistent backup to protect virtual machines running on all the leading hypervisors, including VMware vSphere, Microsoft Hyper-V, Nutanix AHV, and KVM. If needed, recover data instantly from any point in time. Application-consistent backups with application adapters for physical Windows, Microsoft SQL Server, Unix/AIX and Linux. Automated, fully managed protection for SQL Server and Oracle with source-side dedupe.